The CEO explains his vision. 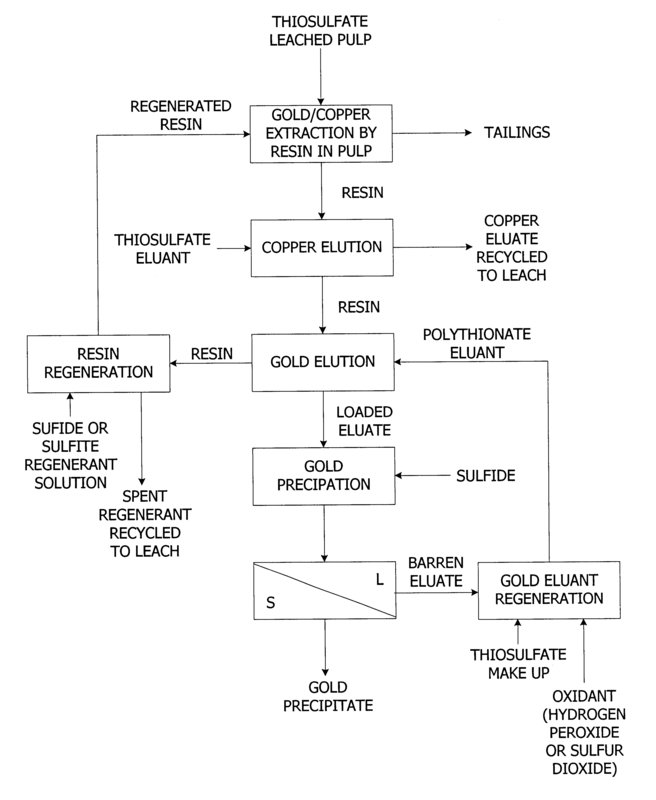 Extraction of gold cyanide by means of ion-exchange resin is accomplished by the inert polymeric hydrocarbon matrix (usually polystyrene cross-linked with divinyl benzene) to which the functional groups are chemically attached. The three-dimensional network of the polymer matix absorbs water and swells when in contact with an aqueous solution, thereby allowing ions present in the aqueous solution to diffuse through the resulting gel to the sites of the active groups. The active groups can be anionic or cationic in nature and the interaction of with these groups and the cations or anions in solution is mostly coloumbic or electrostatic in nature. Therefore, the rate of the exchange reactions are high, reversible, and generally difussion-controlled and the selectivity of one ion over another is predominantly a function of the size, charge. and polyrizability to the ions (Yannopoulos, 1991; Nicol et al., 1987». The chemistry involved in the ion-exchange technology is very complicated, as many different resins are available for use and will not be discussed here. Further reading could, however be done: Helferrich, 1962; Marcus and Kertes, 1969 and Nicol et al., 1987.
leached with cyanide. The partially leached pulp is then conta~led with ion-exchange resin in a resin-in-pulp operation. The resin i, eluted at low temperatures and pressures after which it is then recycled back to the leaching opera’ion. The gold is then precipitated from the eluate, cast into anodes, and purified electrolytically. The problem with the elution of the resin is that the stripping is generally not complete, therefore the resin has to be incinerated after a few cycles to reclaim the contained gold values, which makes the RIP process unattractive due to the high cost of resins. Amalgamation is a process applied to precious metal ores, where the precious metals (such as gold and silver) form alloys with mercury and is known as amalgams (Hentschel and Priester, 1992a). Authors have different opinions as to when this technology was developed, where Rose and Newman (1937) made an educated guess that the process has been in use for the last 2000 years and the two authors: Nriagu (1979) and D’ltri (1972) states that it has been in operation by the Romans since the 4th century BC. An even more recent date is suggested by Hentschel and Priester ;1992b) who states that this type of mining was applied in Bosnia under Emperor Nero 54 to 68 AD. The recovery of gold by mercury amalgamation is still a well known process today and has been used intensively in the small scale mining industry all over the world (Hentschel and Priester, 1992a). The “chemistry” behind amalgamation involves the formation of the gold-mercury (or silver-mercury) alloy, which could contain two, three or four atoms of gold per mercury, giving compounds AU2Hg, AU3Hg and A14Hg, respectively (Hoffmann, 1994; Yannopoulos, 1991). Neither the gold or mercury undergo any chemical changes during the formation of the alloy, but it is rather the attraction and wetting of the gold by the mercury which takes place (Yannopoulos, 1991). 1. The raw ore is processed with the mercury, where fine alluvial gold, free gold from a ground ore or gold from the concentrate of a gravity-separation circuit is recoverable by the mercury. The contact process could be accomplished in gold pans, sluices, drums, tubs, amalgamating barrels or copper plates, edge mills, stamp mills and amalgamating tables. 2. The amalgam is separated from the ore. This is usually done by gravity separation, whereas both mercury and gold have higher densities as the gangue. 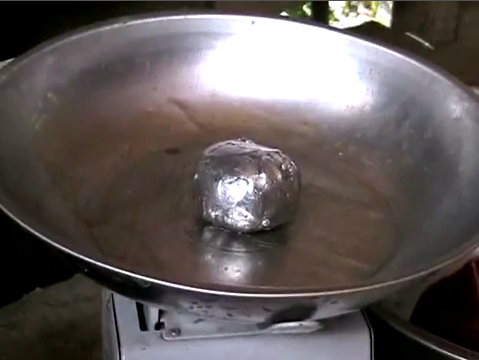 boiling point of mercury (357 DC) so that the mercury evaporates and gold powder remains. This is done either on open fire or closed circuit retorts to minimise the polluting effect. The simplicity of the technique, low investment costs and comparatively high gold recoveries, has made the amalgamation process an attractive means of generating funds in the small scale mining industry (Hentschel and Priester, I992b; Subasinghe and Maru, 1994). Gold ores that are suitable for amalgamation must contain “already liberated gold particles, having a grain size ranging from 2 mm to 20-50 ) that has not been encrusted, for example by ferrous oxides. The shape of the grain. together with the interfacial tension of the mercury and water are the defining factors for the lower limit of the gold grain size to be recovered (Hentschel and Priester, 1992b). Over the past years the gold mining industry has relied mainly upon processes such as cyanidation and amalgamation to recover gold from its ores. It is seen, however that these processes pose a threat to the environment due to the large scale use of chemicals such as cyanide and mercury, which are two highly toxic reagents that require very careful handling. It will be attempted in the following subsections to brief the reader on the dangers of these chemicals. It is seen from section 1.2 that cyanide has been useJ extensively in the mining industry to dissolve gold and silver from pulp. 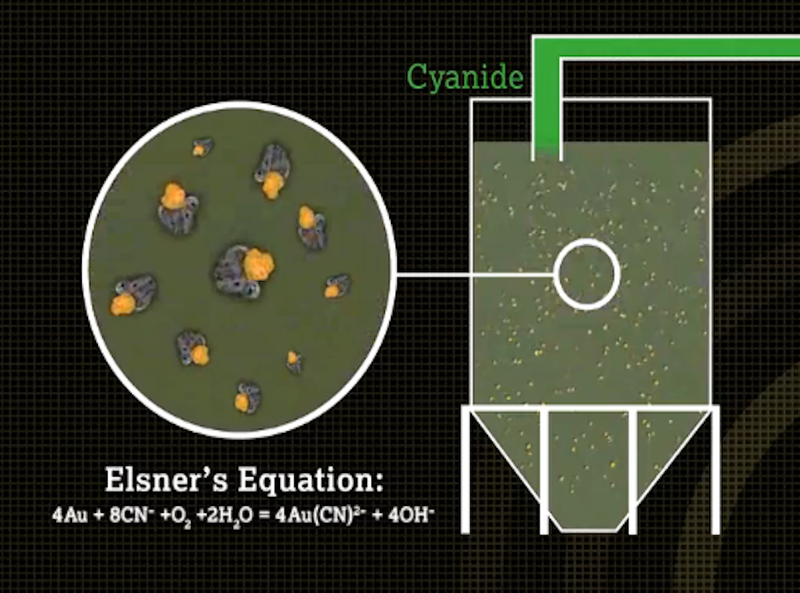 Although many noncyanide leaching agents have been investigated in the past, the use of cyanide has dominated the large scale gold mining industry (SchIettwein and Petersen, 1998). Cyanide exists within the mining solutions in four different forms, and hence the toxicity of the cyanide present in the mining wastestreams, is therefore related to one of these forms i.e. free cyanide, iron cyanide, weak and dissociable cyanides (WAD) and cyanide related compounds. Although the following sub-headings discuss the effect of cyanide in certain dosages with respect to the human body. it is vital to note that bird, wild and aquatic life has been influenced to a large extent as well (Hacker, 1872). 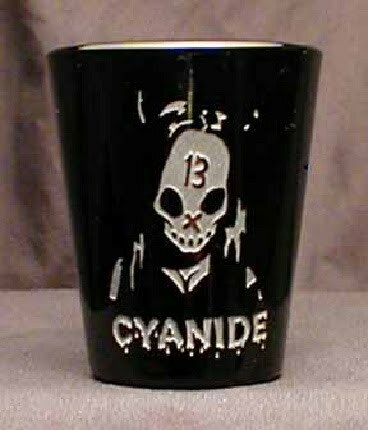 Cyanide is very harmful to the human body, as hydrogen cyanide is absorbed through ingestion or inhalation at a very fast rate and it is then carried into the plasma. Many proteins and enzymes contain key components, such as sulphur, copper and iron, which bind strongly with HCN. An enzyme named cytochrome oxidase, which exists within the cells of the body, is vastly affected and can therefore lead to ashyxiation and tissue death, and eventually failure of all vital functions, followed by death (Smith and Mudder, 1991). In short it could be said that cyanide, if consumed in lethal dose at once, blocks the transport of oxygen accross the cell walls and causes death by suffocation, despite the fact that the victim has fully-oxygenated blood. The central nervous system is the first organ to succumb (Hocker, 1872). The long term health effects of cyanide has largely been ignored, however, there is good reason to suspect that cyanide in lethal dose has serious health effects in long-term chronic exposures at low levels. Correlations have been observed between chronic low level cyanide uptake and specific diseases in human” and experiments on animals have demonstrated progressive damage to nervous and other tissues (Goldfrank, 1986 and Oak Ridge National Laboratory, 1978). that 10mg or less free cyanide per day is non-toxic, where 5 mg/day has shown no harmful effects. To reduce the risk of cyanide toxicity, it is advisecJ that 2 litres of water should be consumed per day per person. Once a person has be~n exposed to HCN in concentrations ranging between 100 and 300 ppm (mg/L), death will occur within ID to 60 minutes, whereas an exposure to 2000 ppm HCN will C’luS’~ death within 1 minute (Huiatt et al.. 1982). The LCso (i.e. the lethal concentration of a toxicant that causes death of 50% of the population of organisms in a specified period) of free cyanide absorption is approximately 100 mg/kg of body weight (Smith and Mudder, 1991). high technology process would not appeal, as additional funds and effort are required for a higher education. The miner has only one main concern: winning gold! The impact of mercury on the environment is either chosen to be ignored or due to lack of knowledge is not known to these men, which makes the extent of poisoning and pollution even more serious than anticipated. Mercury is a highly toxic metal. With regards to its toxicity, three major chemical forms of the metal must be distinguished: mercury vapour (elemental mercury), organic mercurials and salts of mercury (Ciimara et af., 1997). I. The first loss of mercury to the environment is in the tailings after it has been contacted with the ore, whereas the excess mercury is washed away in the form of floured mercury (very small mercury droplets). When in the aquatic environment, microorganisms can convert mercury into methyl mercury, which is more toxic than the inorganic forms; the compound is taken up by rlankton algae and is concentrated in fish via the food chain, reaching much higher concentrations than the originally found in the environment (Ciimara et af., 1997). People living up to 200 miles downstream then eat the fish. 2. Futher mercury losses occur when the excess mercury is removed from the amalgam by wringing out the solids in coUon cloth/chamois leather, as discussed before. 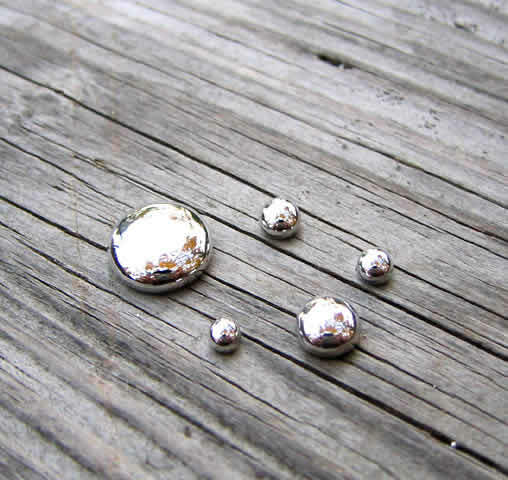 This mercury occurs in the form of metal mercury droplets, which are lost to the environment by further handling and vapourise in time. 3. After the above step, the remaining amalgam then contains half gold and half mercury by weight. The mercury is then simply roasted off, great amounts volatilizing. Here the major loss of elemental mercury occurs to the atmoshpere. 4. Finally the amalgam, containing about 3 to 5 % mercury in its composition is then taken to gold-selling stores located in urban centres, where it is reburned to end stage purification and its gaseous residues emitted to the atmosphere without treatment (Camara et aI., 1997).